We feel it is important for our community to learn Panjabi because Panjabi is the mother tongue of the Panjabis as well as the language of the Sikh Religion. Through learning Panjabi, we gain an understanding of the Sikh cultural and spiritual heritage and develop a strong tie with the Panjab, the birthplace of Sikhism. More importantly, the Guru Granth Sahib Ji is written in Gurmukhi and it is only through knowing and understanding Punjabi that a Sikh can fully participate in the worship of the Guru Granth Sahib Ji in the sangat. The Panjabi Language School teaches Panjabi up to G.C.S.E level. 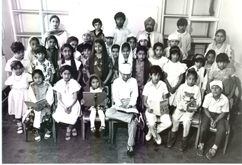 It was opened in 1975 and since then over 2,500 children have been taught Panjabi in this school. Currently there are nearly 200 children attending the school, aged from 5 to 16 years. The aim is to provide fun and enjoyable activities for children to learn to speak, read and write in Panjabi. The starting age is 5 years and most progress to take GCSE Panjabi with an excellent success rate. Fun days and Prize days are held annually in August/September and help to encourage and inspire the children and their families. If you are interested in enrolling at the Panjabi School please contact us at the Panjabi School or pick up a form from the Gurdwara Library. The Panjabi classes for children are held as two separate sessions every Sunday. The first session is from 10:00am to 11:30am and the second from 11:30am to 1:00 pm. These are the key calendar dates for the Panjabi school in 2017/2018.